Metal Sonic makes his grand return to fighting Sonic in White Park. He used Tails' rocket to catch up with Sonic from his own adventure and is now ready to take on the blue blur once again. Metal Sonic attacks with straight rolling, mixing it up with jumps as he is damaged. 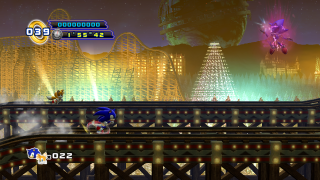 You can use the springs on the tracks to switch tracks on the roller coaster, which can help you dodge attacks, but Metal will attack you on that lane if you stay there long enough. Simply hit Metal when he is not glowing in a purple aura to damage him. He will usually be in this state after trying to attack you. When Metal is barely flying, he will attack you with electric bursts which will be in three configurations. One you will have to jump through, one you roll under, and one you need Tails to get over. After dodging three in a row, he will be in his attackable state. This page was last edited on 10 May 2018, at 09:38.